The most complete, up-to-date guide to sites related to greater Los Angeles. Includes Orange, Ventura, Riverside & San Bernardino Counties. Updated: 12/23/96 Links: over 10,050! If it's on the web and in LA, it's in @LA. Featured User Feedback: Very well put together site. We encourage you to check @LA regularly. We are adding 100 to 200 new links every week to maintain @LA as the most comprehensive listing of net-based information for anyone living in or planning to visit the greater Los Angeles area. Watch for exciting new features in the coming months. @LA is maintained by Technique Development, which provides Internet services to businesses (i.e. marketing on the Internet), develops database applications, offers database and Internet training and provides shareware. Please take a couple of minutes to check if you've seen any of these children reported missing from the greater Los Angeles area (it's only 50KB!). @LA was created to look best when using one of these advanced browsers. All text and images ©1995-96 Technique Development. All Rights Reserved. 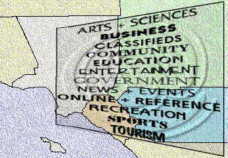 @LA is a registered servicemark of Technique Development. The information on this page is presented as is. No warranty as to the accuracy of any of the presented information is implied. This page is located at https://www.at-la.com. @LA has been online since June 1, 1995. For questions/comments/feedback, send email to [email protected].